When the wife of a blind composer discovers that her husband will cut her out of his estate, if he discovers that she is having an affair with a young artist, she and her lover plan to commit the perfect murder. Richard Wordsworth ... Maxwell, the M.P. David Graham: What did Alec say about me? Brian Stanford: I got the impression you were about to write the greatest novel ever written. Did you? David Graham: In common with quite a lot of other writers... I had been about to write it for a very long time. Time has no pity, no sympathy, no joy and no sorrow. It's passage denotes the brevity in which the living inhabit the earth. In TIME WITHOUT PITY, a young man is dong time in prison for a murder he did not commit. A correctional institution is about to put a stop to that young man's time at the behest of the State. A father caught between the daunting task of fighting the system for more time, and forgetting time altogether at the bottom of a whisky glass. A broken woman mourning the loss of time never spent with one who's out of time. 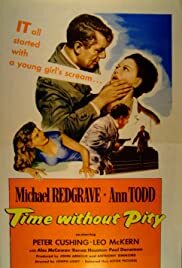 Every character in this drama is lost somewhere in their own guilt ridden space and time, but director Losey makes sure his audience is always aware, littering the screen with watches and clocks ticking like a giant timebomb about to explode as the desperately pathetic father searches for a clue to disable the alarm. Lost in an alcoholic haze that is almost dreamlike in it's ability to paralyze action, he clumsily attempts to win back for his son the time he let slip away. Is it too late? An incredibly edgy, self-aware film, TIME WITHOUT PITY clearly states its objection to the State as executioner. From the opening scene, we know the son did not commit the murder, but neither the State, "You must keep your visit short . . . we don't want to upset the prisoner," the Church, "He's given himself over to more compassionate hands," or the anti-capital punishment advocates, "We're not interested in whether young Graham is innocent or guilty," seem to have a specific interest in the individual. To make matters worse, young Graham himself has given up hope and when his father pleads, "don't give up," he asks, "What difference would it have made if you had died when you were my age?" And this question gets to the core of the film; it's resonance heavily influencing the final pivotal scene.